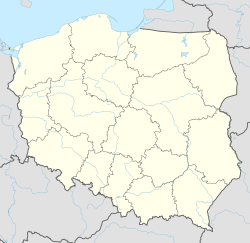 Zakliczyn [zaˈklʲit͡ʂɨn] is a town in Tarnów County, Lesser Poland Voivodeship, Poland, with 1,558 inhabitants (2006). Zakliczyn lies on the right bank of the Dunajec river, surrounded by wooded hills 300 to 500 metres (984 to 1,640 feet) above sea level. Zakliczyn has a town hall, located in a spacious market square, one of the largest in the province, at 100 by 170 metres (328 by 558 feet). The town was originally called Opatkowice; its name was changed in 1558, in honor of the village of Zakliczyn, Myślenice County, which was ancient seat of the Jordan family. In 2008, Zakliczyn was selected with 19 villages of Europe (Germany, Poland, Italy and Spain) for the Spanish documentary film Pueblos de Europa ("Villages of Europe"), produced by Juan Frutos. The history of Zakliczyn dates back to 1105, when a settlement called Dunaiz was mentioned in a document of papal legate Gilles de Paris. According to the document, the settlement had since 1086 belonged to the Tyniec Benedictine Abbey. In 1215, the village of Opatkowice was mentioned in a document of Bishop of Kraków, Wincenty Kadłubek. At that time, Opatkowice administratively was under the jurisdiction of a starosta from Czchów. By 1326, the village already had a parish church, and in the 14th century, Opatkowice developed, thanks to its location on the Dunajec river merchant route from Tarnów to Stary Sącz and further on, to the Kingdom of Hungary. Weekly fairs at Opatkowice attracted merchants from other towns in the area, such as Bobowa, Ciężkowice, Tuchów, and Wojnicz. In ca. 1340, the church at Opatkowice had 465 parishioners. The village still belonged to the Tyniec abbey. In 1557, local nobleman Spytek Wawrzyniec Jordan of Trąby coat of arms (the owner of Melsztyn) purchased Opatkowice from the Tyniec Abbey, and on July 17, 1557 in Vilnius, King Sigismund II Augustus allowed Jordan to establish a Magdeburg rights town, located at the foot of the Melsztyn Castle, on the right bank of the Dunajec, in the location of the village of Opatkowice. In 1558, the town’s name was changed to Zakliczyn. By 1581, Zakliczyn was the 10th biggest town of the Kraków Voivodeship, and its shoemakers were famous in Lesser Poland. Zakliczyn prospered in the late 16th and early 17th century (see Polish Golden Age). Together with Melsztyn, the town belonged to the Zborowski, Sobek and Tarło families. In 1639, the wooden parish church burned, and Zygmunt Tarło funded a new stone church (1641–50). In early 1615, Zakliczyn burned in a fire, in 1652-53 many local residents died in a plague, and on January 5, 1656, during the Swedish invasion of Poland, Zakliczyn was burned and ransacked by the Swedes. Despite several royal privileges, tax exemptions and additional fairs, the town never recovered from the destruction. By 1712, it had only 27 artisans. In 1683, King Jan III Sobieski rested here on his way back to Warsaw after the Battle of Vienna. From 1744 to 1886 Zakliczyn belonged to the Lanckoroński family. In 1772 (see Partitions of Poland), the town was annexed by the Austrian Empire, and until 1918 was part of Galicia. In the early 19th century, a new town hall was built, and in early 1846, local peasants attacked members of Polish nobility (see Galician slaughter), murdering many of them. In 1867, the population of Zakliczyn was 1,415. During World War I, the town was destroyed after heavy Austrian - Russian fighting, several military cemeteries from that era still exist in local villages. In the Second Polish Republic the situation did not improve, and to make matters worse, Zakliczyn suffered widespread destruction in the 1934 flood in Poland. Finally, in 1934 it was stripped of town charter and became a village. In 1939 Zakliczyn had the population of app. 2,000, with Jews making 50%. Almost all Jews perished in the Holocaust, German occupiers also burned several villages, killing during World War II app. 500 Polish residents of the village. The Wehrmacht units retreated on January 17, 1945.
wooden houses from 18th and 19th centuries. Closest airport: Kraków, closest railway station: Tarnów. Regular bus services take residents to Kraków (2hrs by coach) Bochnia, Brzesko, Tarnów (40mins) & Nowy Sącz (30mins) as well as many small villages in between. Zakliczyn is home to a sports club Dunajec, founded in 1973. Wikimedia Commons has media related to Zakliczyn.